Today is National Noodle Day according to my favorite foodie holiday source, National Day Calendar. For my pasta loving self, it could be National Noodle Day every day. My first celebratory thoughts went to my Fried Spaghetti Carbonara Balls or some rich creamy dreamy fettuccine Alfredo, but I recently got back from a vacation, which means vacation eating. (Vacation splurge meals, don’t count, I tell myself, right?) So I knew I had to turn my attention to a healthier alternative and to the bowl of leftover vegetables in my fridge. I’m making one of my old favorites: Pasta Primavera. We love our veggies in this house and I love that this meal only takes 15 minutes. It’s definitely a healthier pasta alternative with no butter or cream, but if you insist, you could add it along with leftover rotisserie chicken, too. It is a very light lemony pasta meal and I usually reserve it for hot summer days not Fall ones…but it’s still in the nineties here! One of my favorite things to do when boiling pasta is to throw in a peeled garlic clove or two. The result is nice soft garlic for spreading on bread for the easiest garlic bread ever. For this recipe, you’ll want to throw in a few more cloves for the sauce, too. Boil pasta according to package directions along with garlic cloves, but do not drain pasta. Remove garlic cloves and mash. In a skillet over medium high heat, add stock. Simmer 5 minutes. Add lemon juice, zest, Italian seasoning, mashed garlic, white wine, and 1/2 cup of pasta water. Simmer 5 more minutes. Add leftover vegetables. Turn heat to low. Saute until vegetables are heated through. Using tongs, remove pasta and toss in the sauce along with Parmesan cheese. Top with shredded Parmesan or Mozzarella cheese, if desired. Leftover rotisserie chicken may be added along with the leftover vegetables. Equal parts butter or cream can be substituted for the white wine. *Microwave lemon in water for 15 seconds to get more juice. 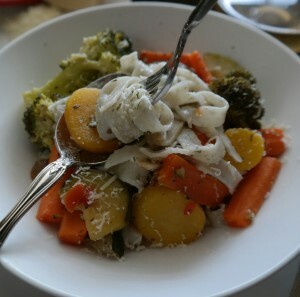 That’s It: Have a tasty Pasta Primavera twirl! 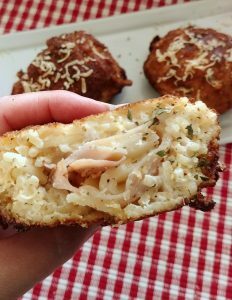 If you happen to have leftover noodles, go ahead and indulge in the fried cheesy pasta balls for me…please. Put your TO COOK IS TO CREATE thinking cap on: Have some sliced cherry tomatoes or sun-dried tomatoes? Add them. How could you change the seasoning based on what veggies you are using? How about Cajun or Mexican spices? 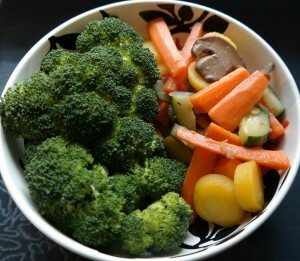 Only have one kind of vegetable, highlight it! I have used all broccoli, 1 TBSP peanut butter in place of the wine, butter, or cream and topped with crushed peanuts for “pad thai” style noodles. Is your family a bunch of cheeseaholics? 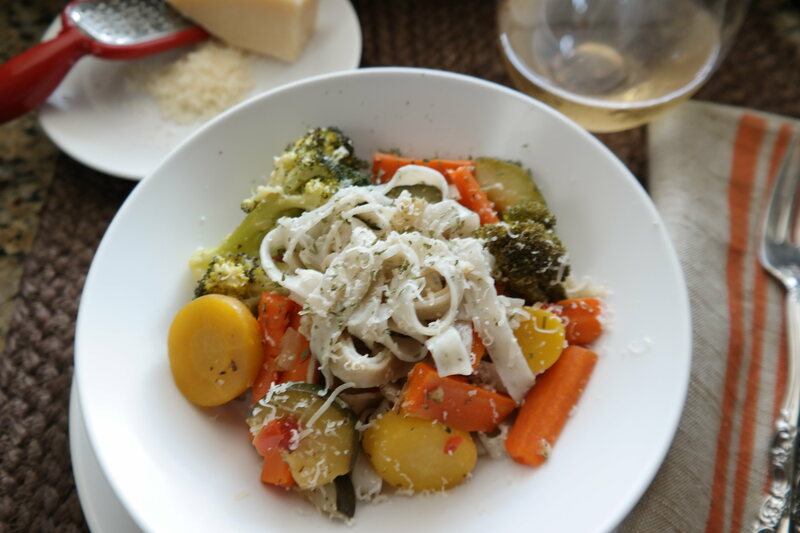 Put pasta Primavera in casserole dish mixed with ricotta cheese, top with mozzarella cheese and bake until cheese melts, like a vegetable casserole. Meat eaters? Add leftover rotisserie chicken or sliced smoked sausage. Have leftovers? Stuff eggplants and bake. 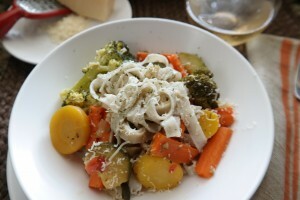 FOOD FUN: Doesn’t it seem as if Pasta Primavera, has been around for ages in restaurants? But it didn’t premiere until the mid to late 1970’s in a New York restaurant, Le Cirque. According to the restaurant’s history, however, Spaghetti Primavera was never actually put on the menu. It is said, the chef at the time, didn’t want “spaghetti” in his kitchen, so the dish was prepared tableside. It still is not on the menu, but can be requested and served without denial from the kitchen.